Sad news today that Sir Roger Moore has passed away at 89. 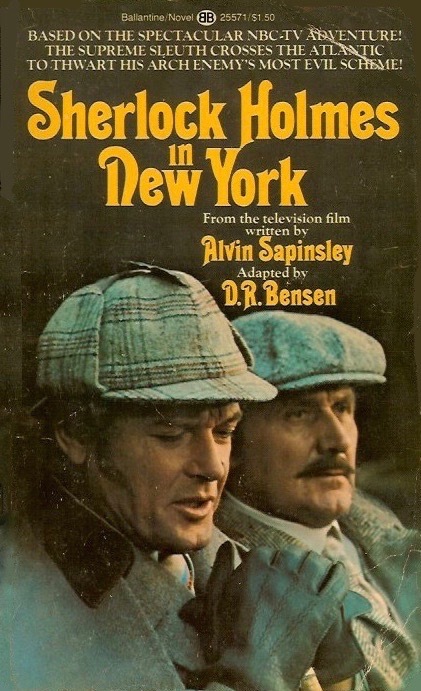 Roger played Sherlock Holmes in the 1976 made for television movie Sherlock Holmes in New York co-starring Patrick MacNee as Watson, John Huston as Moriarty and Charlotte Rampling as Irene Adler. This is the novelization by D.R. Benson. "WATSON – THERE'S NOT A MOMENT TO BE LOST! WE MUST SET OUT FOR NEW YORK THIS VERY DAY!" With this hasty entreaty the world's most dauntless detective is off on adventure once again. Here in the sin capital of the New World–where his beloved Irene Adler faces a nameless peril, where his evil nemesis Professor Moriarty plans "The Crime of the Century," where danger waits in countless shadows, HOLMES MEETS HIS GREATEST CHALLENGE!"